ManCity captain suffers a hamstring injury on Monday nights 3-0 defeat to Liverpool. 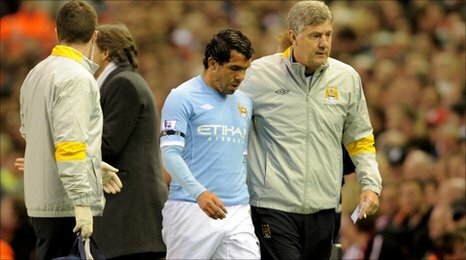 Initially Tevez was expected to be out for two weeks but unfortunately it looks like he will be out for about a month which is really sad as he will have to miss the FA Cup semi-finals against ManU on Saturday. It is a major problem for City given Tevez is by far their most prolific striker. However, Mancini will be forced to rely on either or both of Edin Dzeko and Mario Balotelli to derail United's Treble bid. "I still have to decide what to do," said Mancini. "But both players know this is an important chance for them. "Every player knows this is an important moment for the club. "If we will we can go to a final, so every player will give 100%."